Oh yes. So I did. 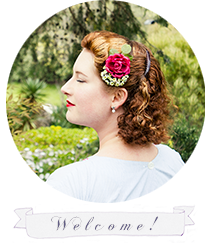 After all, when you come across fabulous posts on how to wear and style a pillbox hat, such as the one written by Tanith of Tanith Rowan Designs, suddenly the endless eye-catching possibilities of styling a pillbox chapeau are revealed! When I read Tanith’s guide to wearing pillbox hats, I was really excited to discover that not all pillboxes are the same, and that there are actually some really cute pillbox hats out there. Now, Tanith and I had been discussing a sweet offer for a loan of a pillbox hat from Tanith’s hat collection, and I was extra excited for it to arrive after I saw that post. Much to my joy, when it arrived, the hat was everything I had hoped for and more! I have discovered the important difference between pillbox hats I like, and pillbox hats I don’t like. Because the pillbox hat was so popular in the late 1950’s ~ early 1960’s that’s the era that I most associate the hat with, particularly with the First Lady Jackie Kennedy and her classic style. As I am an enthusiastic fan of the 1940’s to mid 1950’s fashions, and much prefer those looks to anything later, I tended to dismiss the pillbox style as outside of my chosen era. Recently however, I have discovered that the pillbox is actually quite a wide spread style, that spans back further than I initially thought. But there does seem to be quite a difference to the shape and the way the pillbox is worn between the different periods. If you look at the classic 1940’s pillbox, they are actually quite small, and are usually worn on a tilted angle positioned towards the front of the head, or perched on the back of the head. Whereas later on, the hats are larger ~ they are taller and wider, and usually worn squarely on top of the head. You might also see them tilted towards the back of the head in a similar manner as in the 40s ~ yet the results of the look are entirely different due to the hair styles and shapes of the pillbox. Now, whether this darling maroon pillbox hat is a vintage 1940’s chapeau or not, I’m not sure ~ but it works so perfectly for a 40s look that I just adore it! I smitten with the cute bow on the front, the rich garnet color and the tiny size. Smaller is definitely better when it comes to pillbox hats I believe! Do tell me about it ~ I think it’s so fun when you discover new taste changes in your style preference!